The study of traditional Japanese music at the university dates back to the Ongaku Torishirabegakari (Music Investigation Committee) established in 1879. Study of traditional Japanese music has been ongoing at the Tokyo Music School since its establishment in 1887. The Department of Traditional Japanese Music was first established in 1936, the 49th anniversary of the school’s founding. In a controversy marked by strong opinions, the university considered abolishing the Department of Traditional Japanese Music during the transition to the new university structure. The decision to keep the Department of Traditional Japanese Music was made the year after the founding of the Faculty of Music, and the department was then and continues to be the only such department at any arts college in Japan. 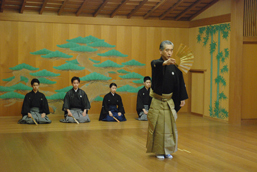 The Department of Traditional Japanese Music trains gifted students through research and classes on practical techniques and performance theory. Classes focus on shamisen music (nagauta, tokiwazu, and kiyomoto), Hogaku Hayashi (accompaniments to traditional Japanese music), Japanese dance, Sokyoku (koto), shakuhachi, Nogaku, Nogaku Hayashi, and Gagaku (Japanese ancient court music). In addition to practical techniques, students in each program of study enroll in required and elective classes that teach practical techniques in various types of traditional Japanese music, Western music, solfege, and other topics. Students are also required to attend classes in performance theory and related subjects (including Western music theory), in addition to practical techniques. In this way, the curriculum trains performers and future music professionals in a broad range of musical knowledge. Following graduation, many students go on to become active in the front lines of various musical fields, as performers, instructors, or educators. Graduates also advance to graduate school to pursue a more focused and advanced study of practical performance techniques and performance theory. Students intending to earn teaching credentials must prepare for a campus selection exam of piano performance skills, administered immediately following admission. The curriculum encourages students with advanced techniques and profound knowledge in their major field of study through private lessons, lessons in the form of concerts, and nurturing fundamental skills in classical music. Practical techniques in the sub-major are determined for each department and a broader level of understanding is nurtured. Furthermore, students can also select solfege, gain a comprehensive understanding of traditional Japanese music, as well as develop an objective understanding on their major. Students can acquire a general education; they study language and philosophy, developing a broad perspective, international sensibilities, and an enriched humanistic outlook. 4. Students have perennial diverse opportunities [Remark 2] such as general practical training in the form of concerts, regular concerts, university concerts, concert trips, and graduation concerts. They develop abilities and knowledge for actual performances, and ultimately perform in the graduation concert, which is equivalent to the graduation thesis. 1．Students develop intensive techniques and study skills through private lessons on practical techniques in one’s major and the teaching of more advanced and specialized techniques and theory. 2．Guidance is conducted for the research themes that students in the special study of traditional Japanese music have selected on their own, and fundamental abilities to write the thesis are nurtured. 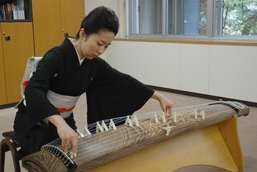 Students can select subjects related to their research topic and performance techniques, which can expand the insights related to their major research and performance technique, and can develop the abilities to gain an understanding of traditional Japanese music from a broad perspective. Students acquire advanced ensemble skills from regular and other concerts. Through the completion concert, students acquire not just performance techniques but also learn to manage concerts in a systematic way. Doctor: In keeping with the educational philosophy of TOKYO GEIJUTSU DAIGAKU, and in order to achieve the diploma policy of the doctoral program, the following educational policy has been planned: 1．Specific themes related to specialized subjects and practical techniques particularly relevant to the doctoral dissertation are set; guidance based on these ideas is provided. Students further advance their understanding in the theory and research of their doctoral specialization and acquire a comprehensive understanding of their specialized art from a broad range of perspectives. 2．Each year, students perform a doctoral recital with guidance from a supervisor of the special doctoral research in front of the Thesis Review Committee. Students acquire the ability to plan and manage a concert that is in line with their research theme; this enriches their experience in conducting concerts, and increases their conducting expression. In the thesis review, they are expected to demonstrate advanced abilities related to concerts. In their doctoral dissertation, they will further expand on the knowledge of their specialization and develop the capabilities to express it in the form of a dissertation. Faculty: The role of the Faculty is extremely significant as it has the only Department of Traditional Japanese Music among national universities in Japan. Therefore, students are required to learn and inherit the theory and techniques of traditional arts as represented by each department, as well as expand their knowledge and experience about various kinds of music, including Western music. Through these abilities, students will hone their sensibilities and expressive capabilities, utilizing them in concerts, research, and education related to their major. The undergraduate classes focus on shamisen music (nagauta, tokiwazu, and kiyomoto), Hogakubayashi (accompaniments to traditional Japanese music), Japanese dance, Sokyoku (koto), Shakuhachi, Nogaku, Nogakubayashi, and Gagaku (Japanese ancient court music). Through the study of a minor, students can avail the opportunity to become familiar with musical instruments outside of their major and acquire the fundamental abilities to gain a comprehensive understanding of traditional Japanese music. The Bachelor’s degree is awarded once students have acquired all of the stipulated credits for the practical techniques, specialized subjects, and concert theory in each major, minor, and related departments including general education in liberal arts and have completed comprehensive practice in the form of concerts, the university concert, and the graduation concert. Master: In the Master’s Program, students are required to learn advanced concert techniques and enhance the basic principles of research skills needed to write a thesis, thereby acquiring research skills in music. Students are required to write a thesis, which is an aspect distinct from the undergraduate studies. By writing a thesis from the perspective of a musician, students are able to mutually associate the concert with the thesis, thereby increasing the quality of expression, and deepening and developing their understanding of their specialization. Furthermore, in the process of expanding the knowledge of their specialization, students advance the understanding of traditional Japanese music from a broad range of perspectives, cultivating the abilities that will demonstrate leadership skills in ensembles. In the Master’s Program, the Master’s degree is awarded once the stipulated credits for each year have been obtained, the completion concert has been held in their final year, and the thesis and the oral examination have been completed. Doctor: In the doctoral program, a research theme is selected and the focus is on honing practical techniques in one’s specialization, with an emphasis placed on the doctoral dissertation. Once a unique theme is set from the perspective of the concert, students are required to mutually associate the concert with the dissertation, set a plan for the year, and work toward it. With regard to their specialization, students will acquire advanced techniques and knowledge by working with the musicians, artists, and educators who act as the core advisors; the students will develop a broad perspective, deliberate, and develop creativity. By planning the doctoral recital as a collaborative project, students will acquire advanced techniques as musicians and cultivate the abilities to plan and manage a concert. In the doctoral program, the doctoral degree is awarded once the stipulated credits for each year have been obtained, the annual doctoral recital has been conducted, and the dissertation review and the oral examination in the final year have been completed. As the only department of traditional Japanese music at a national university in Japan, the department views its mission as the study of the classics in each genre and the provision of practical guidance and training in performance theory, as well as the expansion and deepening of student knowledge and experience over a wide range of music, including Western music. The goal is to impart general music capabilities and music theory in a systematic manner and to train outstanding performers and educators. The department seeks to provide undergraduates with more in-depth techniques and knowledge by identifying major and minor practical techniques for each program. This is done through individual lessons on practical techniques, general practice in the form of recitals, general university recitals, and public graduation recitals. To improve basic student skills across a broad range of music, the department also teaches students the ability to grasp and work with diversifying musical genres by incorporating study of Western music solfege. The goals of the master’s program curriculum are to impart more advanced performance techniques; raise the level of basic academic research skills needed to prepare the master’s thesis; and provide students with the skills needed to study music at advanced levels. In addition, through accompaniment and supporting performances in each recital, students build the foundations for active careers as performers. The master’s degree exam assesses students for proficiency in practical performance techniques. The exam also includes an oral component on student thesis work. Students in the doctoral program handle all aspects of the annual doctoral recital on their own – from planning to management and performance – as each student plans and presents a recital on themes tailored to his or her specific research goals. The doctoral degree exam evaluates student proficiency in recital performance. The exam also includes an oral exam component on student thesis work.